Since 1992 we have been involved in buying and collecting clippings from yew hedges from houses and gardens throughout Great Britain to supply the pharmaceutical industry with the raw material for cancer treatments. Yew trees grown in gardens as hedges or topiary are best clipped each year to maintain their shape and clear outline. Rather than burning or composting the growth that is removed, clippings can be collected and used in the manufacture of chemotherapy treatments for cancer. We pay per kg for the clippings. We start collecting yew clippings in July and generally stop collecting at the end of the first week in October. We are interested in collecting clippings of one season’s growth from annually clipped plants. We accept all forms of Taxus baccata (English yew) including golden and Irish forms. We can also collect the hybrid Taxus x media (Hicksii). The compound (known as 10-Deacetylbaccatin III) is found at the highest levels in the fresh growth of plants which are clipped every year. The annual clipping stimulates the production of higher levels of the compound than in unclipped plants. This is therefore why we are looking for the single season’s growth, removed in the annual clipping. Unfortunately, we are not able to take material from either unclipped trees or material from plants which have not been clipped in recent years and have older woody growth. Levels of the compound are lower and mean that extraction would not be worthwhile. 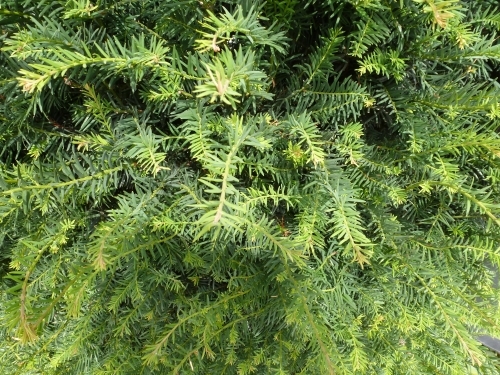 English yew (Taxus baccata) contains a compound, 10-Deacetylbaccatin III, which can be extracted from clippings and used as the raw material in the production of chemotherapy drugs paclitexel and docetaxel. Paclitaxel (Taxol ®) is a chemotherapy drug used to treat different cancers including ovarian, breast and non-small cell lung cancer. If it is possible, please inform us in advance of when you plan to clip or when you start clipping. This enables us to plan our collections so that we can remove the clippings as soon as possible after you finish. When clipping, collect up the clippings and store them prior to us collecting. The best way to keep them fresh is to spread the clippings in a layer no more than 30cm deep under cover. If this is not possible then they can be spread on a sheet outside, preferably in the shade. If neither of these options is suitable for your site, please call or email us to discuss your arrangements and hopefully we can work something out. We generally collect when a property finishes clipping or, if clipping takes longer than a week, when we are in the area on a weekly basis. We collect in vans fitted with small cranes and scales (to weigh the clippings) and travel to most areas of the country at least once a week. We tend to make collections from several properties in an area on one day. When we collect, we fill tote bags with clippings then weigh them prior to loading them into the van. Payment is made promptly either by cheque or into your bank account (at a price per kg collected), after we have made the final collection.